is oshi-tsubushi, literally "squashing push", a Japanese term (also used in English, but in English it is called internal liberty shortage by Robert Jasiek) for a life and death tesuji. The everyday translations, crush, squash, and smash, are also occasionally seen. After , White's connection at the marked point is an illegal suicide move under most rulesets. 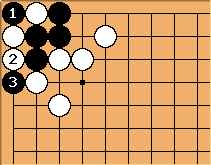 Later Black can capture the two White stones, gaining two eyes and life. 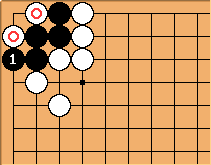 Under rulesets which allow self-capture, is possible; the three White stones are then immediately removed. 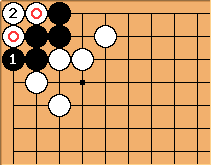 If White can play at the point it would kill the black stones. now makes life, and so because Black must respond to attain it, the self-capturing move can be used as a ko threat. 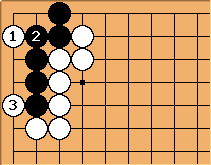 If White to play in the original position, he can kill Black by connecting at and forming nakade. 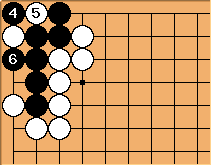 If captures the three stones, White 3 at holds Black to one eye. Oshi-tsubushi can be prevented by damezumari. In this position, Black's lack of liberties means that after he is still in atari. here doesn't understand the position. Now Black can live. Black lives with the sacrifice and oshi-tsubushi at . White should have recognised that this is a bent four in the corner position and played at himself.